Moving in to Phoenix, Arizona? Worried about the packing and transport? Worry no more. Cor Movers provides number 1 moving services for local as well as long distance moving. We cater to all your needs for residential as well as commercial moving, junk removal and packing. With our headquarters in Phoenix, we also serve in other cities of Arizona as well as a few locations around the state. Our services are delivered to you by ultimate professionalism and righteousness. We bring to you reliable and stress free moving and packing services. If integrity is your domain of doubt, we are here to provide complete guarantee of zero hassle and zero damage to your goods. We focus on the customers’ expectations and aim to fulfil them all. You can be sure of having your goods moved to the correct location, on time and unharmed. It is important to choose the best rated services for packing and moving your goods whether you are relocating somewhere close by or far away. To help you with the same, Cor movers provide you with tips and techniques to start off an efficient and easy process of shifting. It is critical that the customers get their goods as they were. Since moving appliances for homes or offices can be a tough task, we provide the best methods, ideas and packing services for quick and safe moving of the same. It can be a pain, maintaining count and keeping an eye on each and every package going in and out of the house, or the office. Once the deal is in our hands, you can lie back, and be assured that your belongings are in good hands. We provide reliable services and our handymen are here to answer all you questions and doubts with most respect and courtesy. 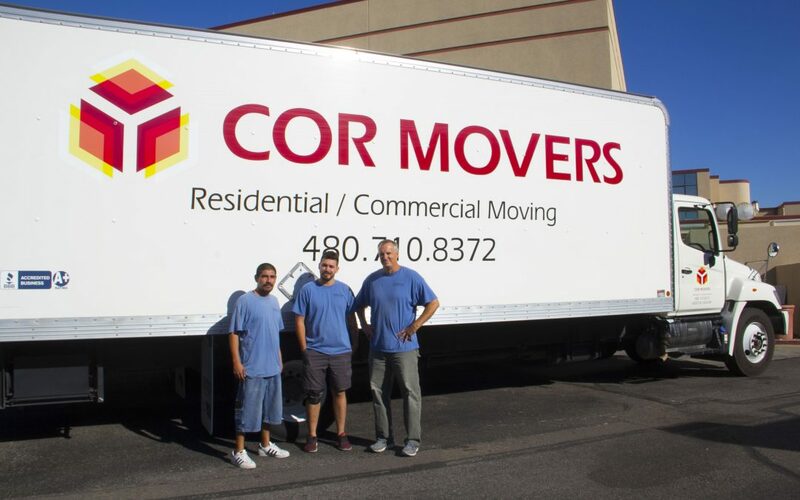 Cor movers are known in and around Phoenix, Arizona, to be one of the most reliable, punctual, trustworthy movers and packers in town. The feedback from over a 1000 customers has been so overwhelmingly positive and friendly, we are motivated every day to provide better. Our junk removal services in Phoenix, Arizona are one of the best too. We provide with solutions of taking out all the waste in the most efficient way and you won’t have to worry about where and how to take them out. It might be difficult to trust a company and a few strangers, carrying your goods around and to a distant location. With Cor Movers, Phoenix, AZ, you can sit back and relax. We offer the best services at the best prices and we promise, we won’t let you down. Our motto is that reliable and integrity based service should be provided to the trusting customers. We handle your home and office essentials as valuable items. What’s yours is ours. Utmost care is taken when handling fragile goods. Best options are provided for different types of moving like residential or commercial. We have a perfect style to fit in all of your needs.